I've just returned from a long road trip. I was traveling to a conference in Salt Lake City, Utah, and we made it a family vacation, to show our son more of this big, amazing country. I blogged from the road, but I didn't want to advertise to every burglar on the internet that our house was empty, so I've waited until now to start posting the entries. We got on the road from Rapid City on Monday morning, planning to drive to Casper, with a detour to Devil's Tower. But along the way, we decided to take another detour on our way to the detour. Casper wasn't that long a drive, and we didn't plan to spend more than an hour or two at Devils Tower, so we figured we had plenty of time. And besides, unplanned detours are one of my favorite advantages of driving rather than flying! 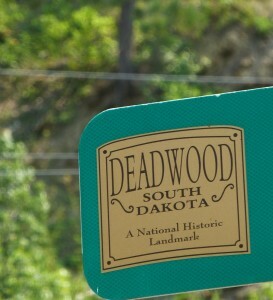 So we headed off our main route so we could drive through a more scenic area, including Deadwood, South Dakota, the wild west town whose most famous denizens were Wild Bill Hickok and Calamity Jane. The whole town is a national historic landmark. Wild Bill, born in Ilinois in 1837, was a legendary gunfighter, sheriff of Hays City, marshal of Abilene, stagecoach driver, army scout, and gambler whose friends included "Buffalo Bill" Cody, General George Armstrong Custer, and Calamity Jane. (That's a bust of him, to the left. 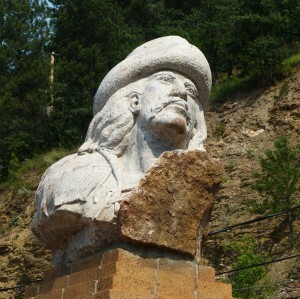 Yes, it's another carved head; we saw a lot of them in South Dakota, didn't we?) Wild Bill Hickok claimed to have killed more than a hundred men. During a poker game in Deadwood in 1876, he was accused of cheating and was shot in the back of the head. He died holding a pair of eights and a pair of aces, which has since been known as a "dead man's hand." Born in Missouri in 1852 as Martha Jane Cannary, the child who grew up to be known as Calamity Jane always preferred riding and hunting to sewing and baking. She was orphaned at a young age and took whatever jobs she could find to support her younger brothers and sisters, including cook, nurse, waitress, dishwasher, and dance-hall girl. In 1870, she began working for Custer as an army scout at Fort Russell, Wyoming, and also began wearing men's clothing. There, she became known as the most reckless rider and one of the best shots in the West. She also worked as a Pony Express rider, a prospector, a hotel manager, a cook in a brothel, and, like Wild Bill Hickok, a performer in Buffalo Bill's Wild West Show. She died, destitute, in 1903. We stopped at the old train depot, now converted to a visitors' center. 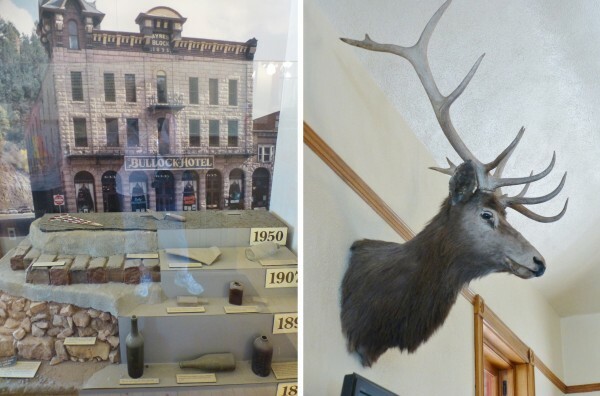 The photo shows an archeological exhibit at the visitors' center, with a historic hotel visible through the window behind it. The visitor's center had no postcards -- a serious oversight, to a Postcrosser like me -- so we walked across the street to buy some postcards at the gift shop at the Adams Museum. The museum turned out to be interesting enough so that we stayed a while and soaked up a little local history. For one thing, there was the mounted head and antlers of an elk named Bob! Then we had lunch at a nearby restaurant bursting with local color. It doubled as an antique store, of the interesting-dusty-stuff-crammed-everywhere variety, so we browsed a bit longer than we had expected. We got back on the road and determined that we still had enough time to continue our slow but scenic, meandering route to Devil's Tower, by way of dramatic Spearfish Canyon. But I'll leave that part for another entry.